In Cold Case Christianity, J Warner Wallace shows you how the same analytical thinking used to crack murder cases where the trail of evidence has ‘gone cold’ can be used to crack the case of a two thousand year old crucifixion and an incredible resurrection. Applying his professional skills as a police homicide detective of more than 25 years experience, Jim Warner Wallace takes you through the fascinating process to reveal how the evidence of history tips the scales of justice in favour of the case for Christianity. For Christians who want to know how best to present the evidence to others, and sceptics who (like Jim, before he really looked at the evidence) this is as eye-opening adventure and life changing journey, full of helpful insights and wisdom. As a follower of Jesus you’ll find much to bolster your faith and sharpen your skills in explaining the case for Christ to others. As a gift for sceptics, the book is a fine technical read, a detective story and a guide to how to examine and evaluate all of the information available. Shadowing Jim as he probes the evidence for faith, you’ll find his logic sound, his approach compelling and his conclusions amply supported. Now you can enjoy a great read, unravel the historical case for Jesus and discover its eternal implications with the same verdict that Jim himself reached: the evidence is overwhelming. Cold-Case Christianity by J. Warner Wallace was published by David C Cook in January 2013 and is our 4319th best seller. The ISBN for Cold-Case Christianity is 9781434704696. Be the first to review Cold-Case Christianity! Got a question? No problem! Just click here to ask us about Cold-Case Christianity. Written by an L. A. County homicide detective and former atheist, Cold Case Christianity examines the claims of the New Testament using the skills and strategies of a hard-to-convince criminal investigator. Christianity could be defined as a 'cold case': it makes a claim about an event from the distant past for which there is little forensic evidence. In Cold Case Christianity, J. Warner Wallace uses his nationally recognized skills as a homicide detective to look at the evidence and eyewitnesses behind Christian beliefs. Including gripping stories from his career and the visual techniques he developed in the courtroom, Wallace uses illustration to examine the powerful evidence that validates the claims of Christianity. A unique apologetic that speaks to readers' intense interest in detective stories, Cold Case Christianity inspires readers to have confidence in Christ as it prepares them to articulate the case for Christianity. - Were the Gospels written early enough for true eyewitnesses? - Is the testimony of the writers confirmed by sources and evidence? - Did the writers falsely report anything to invalidate their testimony? - Were the writers motivated to lie about their testimony? 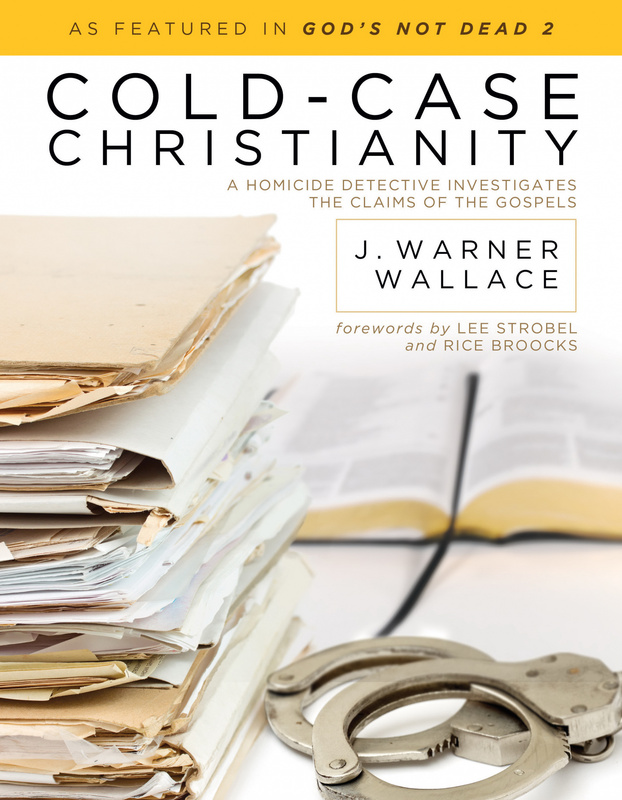 Jim Warner Wallace says… “Cold Case investigations can teach us a lot about how to investigate the claims of the gospels and the cold case for Christianity. Cold case detectives examine the evidence from cases in the distance past for which there are often no living eye-witnesses and little if any forensic evidence. The gospels also record cases in the distance past for which there are no living eye-witnesses and little if any forensic evidence. The skills of a cold case detective can help you determine if the gospels are true. “With 10 important principles, known to all cold case detectives, I want to give you the tools to help you examine the evidence and draw the most reasonable inference and what we can conclude about Jesus from the gospel accounts. You will come away with fresh insight and the ability to put into words what you read in the gospels. “If you’re a Christian, I want you to have the confidence of a good detective. If you’re a sceptic, I want to give you something reasonable to think about. Read ‘Cold Case Christianity’ to discover how evidence is examined and what this evidence tells us about Jesus. Take another look at the evidence for Jesus: from the perspective of a detective. “Jim Wallace has a unique way of helping people think logically about God and spiritual things. He thinks like a cop. Being a cold case homicide detective, he puts together the evidence for God in a way everyone can follow. I know Jim, have worked with him as a conference speaker and listen to him on the radio. Jim has a powerful and unique ministry for the Gospel of Jesus Christ.” - Bob Vernon, Sr. Assistant Chief of Police (Retired) LAPD; Founder of Pointman Leadership Institute (PLI). “Jim spoke to my students recently and did a phenomenal job. He’s passionate, informed, and articulate. He has my highest recommendation as a speaker and as a person. You won’t be disappointed.” - Sean McDowell, Author, Apologist, Speaker, and Editor of the Apologetics Study Bible for Students. “Jim is one of the pre-eminent voices in contemporary apologetic Christianity. He combines Biblical accuracy with career law-enforcement experience, providing a practical worldview that cannot fail to educate and inspire. Unique, purposeful, and motivating.” - John Hall and Kathy Emmons, Hosts of the John and Kathy Radio Show, WORDFM 101.5 (Pittsburgh). “Jim Wallace gives one of the most compelling cases for Christianity that I have ever heard. His work as a police detective has provided him with the proper tools to ‘check out’ the evidence and come to the logical conclusion. Skeptics and non-skeptics alike will tremendously benefit from his presentation. He has my highest recommendation.” - Don Stewart, Apologist, Author, Speaker and Host of the “Pastor’s Perspective” Radio Programme. “The Church needs more Jim Wallaces. I have worked side-by-side with him in a variety of ministry contexts and have seen firsthand the impact of Jim’s work. His experience as a homicide detective gives him a tough-minded approach to the evidence for Christianity. His experience as a pastor provides a tender-hearted approach to people. With both, Jim is able to effectively train Christians to defend the Gospel with intelligence and graciousness.” - Brett Kunkle, Apologist, Speaker and Student Impact Director at Stand to Reason. “Jim is a clear communicator and his Biblical knowledge was a blessing to our TV audience. He has a passion to reach many with God’s truth.” - Larissa Lam, Host of Top 3 on JCTV. In the opening pages of Cold Case Christianity, J Warner Wallace openly admits that Christianity makes a claim about an event from the distant past for which there is little other forensic evidence. So like with criminal cold cases today, the truth of what happened has to be decided in the statements of eyewitnesses and in comparing them with what little other evidence, from other sources, still exists. The aim is to verify the witness statements – the four gospels, with what else is available, and from scrutiny of the gospels and gospel writers, to decide on the reliability of their words and conclusions. On big question any sincere investigator after truth has to ask of the gospel writers is: are their statements genuine and accurate ‘eye witness accounts’ or are they ‘moralistic mythologies’. In other words are the gospel narratives made with the intention of being reliable historically, or were they always intended as vehicle for theology and teaching, filled with untrustworthy supernatural imaginings? Christians are often accused of being biased in their acceptance of the gospel accounts simply because they believe in the supernatural. This accusation carries a lot of weight in our equally biased, secular leaning, society. Biased people are often seen as prejudiced, arrogant, unfair and overly confident of their unjustifiable position. Yet nobody wants to be identified as being biased and opinionated – but we all have a point of view and we all hold opinions. Jurors are routinely asked to ‘keep an open mind,” and not let bias, sympathy or prejudice influence their decisions. Yet everyone begins with a collection of biases to eliminate certain forms of evidence and therefore is already moving toward certain conclusions even before the evidence has been heard. As Christians it’s easy for us to believe that God is at work in his creation, so we can see the evidence for that. When arguing the case for the gospels, we have to somehow persuade our sceptical friends to re-examine their suppositions that the supernatural cannot exist, while respecting their own claims that only the natural can be evidentially proved. That’s the challenge that faces us as cold-case Christians, and Jim Warner Wallace’s book helps you to do just that. Active homicide investigator, J. Warner Wallace, is also a church mission leader and a church planter. Wallace joined a law enforcement agency in Los Angeles County after starting out as a designer and then earning a BFA from California State University at Long Beach and a Master’s in Architecture from UCLA.He has been a police officer and detective for nearly 25 years but wasn’t raised as a Christian. Jim (James Warner Wallace) was a convinced and vocal atheist until he was 35 years old preferring to call himself to be an “evidentialist” based in his experience as a law enforcement officer. Insisting that truth was proved only by evidence, J. Warner eventually took a serious look at the evidence for the Christian Worldview. J. Warner’s book, Cold Case Christianity, gives you ten principles of ‘cold case’ investigation and applies these principles to the gospel eyewitness accounts. His professional, investigative work has featured TV, and he’s earned the “Sustained Superiority” Award. Drawing on over two decades of investigative experience, J. Warner provides gives you the tools you need to investigate the claims of Christianity and make a convincing case for the truth. 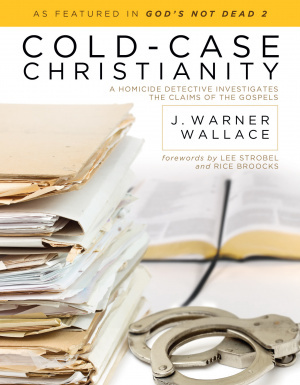 In Cold Case Christianity, J Warner Wallace applies 25 years experience as a Los Angeles homicide investigator to the case for Christ, Christianity and the Christian world view. Using his professional skills, Wallace takes you through the fascinating process to reveal how the evidence of history tips the scales for Christianity. With sound logic and a compelling approach, Jim bolsters your faith and sharpens your skills in presenting the evidence to others. The book is a fine technical read, a detective story and a guide to how to examine and evaluate all of the evidence, which, Jim concludes, is overwhelming.